Hamburg, NY — A pair of $100,000 earners from 2018 locked horns in Buffalo Raceway’s featured $11,500 Open II Pace on Saturday night (Feb. 9) and the two did not disappoint in the main event tussle. Lucky McTrucky scored in the $11,500 Open II at Buffalo on Saturday night. Steve Roth Photo. 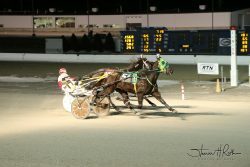 It was Lucky McTrucky (Drew Monti), however, who proved to be the best on a frigid night, topping rival Shady City (Larry Stalbaum) by a half-length in an impressive 1:56 over the fast track. Dark Horse (Ray Fisher Jr.) was third. With the cover starting to fade heading to the three-quarter marker, Monti got Lucky McTrucky ($4.80) into gear and stared Shady City into the eye turning for home. It seemed like Shady City might hang tough but he just couldn’t keep up as Lucky McTrucky used a :27.2 final panel to secure the decision. Lucky McTrucky (McArdle-Truculent Lady) is a 10-year-old gelding that has won twice this season in six attempts, earning $19,990. Owned by Tessa Roland and conditioned by JD Perrin, the victory pushed his career earnings to $519,287. After sitting in third until the top of the lane, Beachy Dream went three-wide down the stretch and zoomed past Southwind Torque (Davis Jr.) who had posted solid splits of :28.4, :57.4 and 1:27.0.